Leading Manufacturer of russian bruting wheels from Surat. Our Russian Bruting Wheels are extensively used for cutting, shaping and finishing several metals like glass, diamond and alloys SID. Due to proven quality goods and reasonable prices, we have covered a vast section of the worldwide market within a very short span of time. 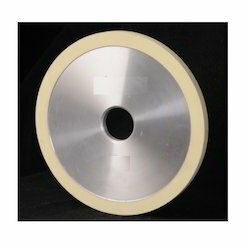 Our magnificent series of innovative products include Diamond Girdle Wheels, Russian Butting Machine Wheels (Ceramic Bond), Metal Bond Wheels, Resin Bond Wheels, Industrial Grinding and Cutting Wheels. We have technology and quality with us, as the two arms of the company, which are extremely strong and powerful. Our manufacturing unit is quite advanced and updated in terms of machinery and equipment. We can produce all kinds of wheels in different dimensions for different purposes, as per the requirements of the clients.